AMACO® Teacher's Palette® (TP) And Teacher's Choice® liquid gloss glazes are completely intermixable so they can be blended with each other or with any of the AMACO® Teacher's Choice® (TC) glazes to create an infinite color palette. The 24 glazes are AP certified, LEAD FREE, dinnerware safe, offer brilliant color, and are safe for use by artists of any age. Try layering patterns and designs with these glazes for a brilliant majolica-style decorative surface. 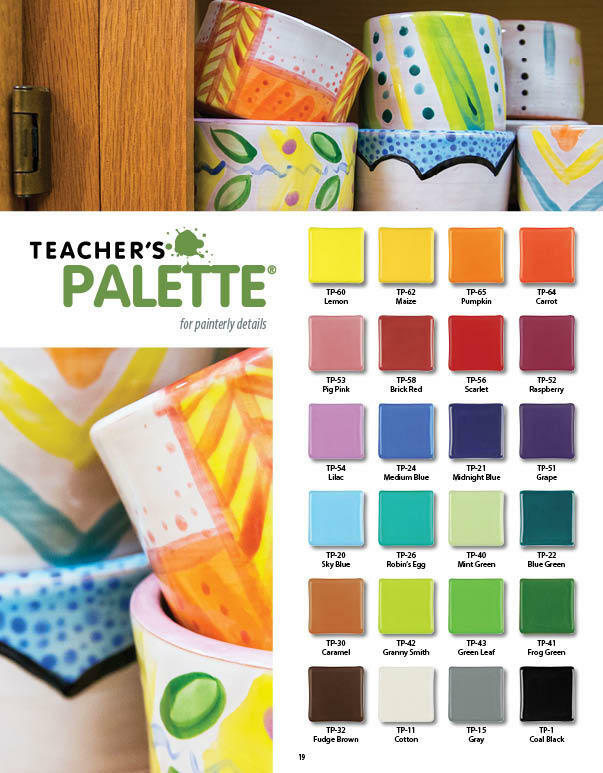 Here is a downloadable PDF of the Teacher's Palette page from the 2015 glaze brochure. The Teacher's Choice and Teacher's Palette glazes are designed to be 100% mixable so you can create you own personal color palette!! Enjoy the endless possibilities! We have provided a blank label to keep track of the new colors you've created with the 100% mixable Teachers Palette glazes! Click the image for a downloadable PDF! Use the Teacher's Palette glaze line to create stiff, colorful painterly surfaces on your work. The colors will not bleed and when fired and will achieve an smooth and glossy surface.